Heading into Comic-Con, Ken Kao’s company has picked up rights to Jeff Lemire and illustrator Emi Lenox’s comic series. Kao will produce with partner Dan Kao and Addictive Pictures’ Russell Ackerman and John Schoenfelder under their first-look deal. Plutona is a coming-of-age story about a group of children who discover the corpse of a famous superhero in the woods. The comic came out as a five-issue limited series via Image Comics in September 2015. 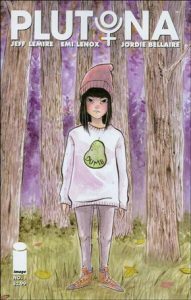 “Emi and I are extremely excited to be working with Waypoint Entertainment and Addictive Pictures to help bring our vision for Plutona to the big screen,” said Lemire (pictured). Lemire is the author of such titles as Essex County Trilogy, Sweet Tooth, The Nobody, and wrote a run of Animal Man. Lenox is perhaps best known for her diary comic Emitown, as well as having her work featured in such series as Nowhere Men, Madman, Glory, and Sweet Tooth. Waypoint Entertainment recently acquired rights to two Mark Millar properties – American Jesus and Supercrooks – which Kao will produce with Kao and Addictive Pictures.